Combine all ingredients in a large bowl and toss well. Once it's good and mixed up, transfer to a bowl, cover and chill until ready to serve. Summertime is salad time -- and fresh veggie, farmers market and pesto time too. Actually, summertime is all things fresh time. I can hardly wait for our farmers market to start next week, and to start cooking with all sorts of fresh veggies. When else can you go to a farm and buy just-picked basil to make pesto? Or pluck fresh tomatoes off the vines in your backyard? Here in the northeast, summertime is the only time. When winter arrives, fresh anything becomes scarce here. So, you can imagine what a big thing it is to have fresh veggies re-emerging. It’s the best, most exciting, wonderful thing. Pesto Pearl Couscous Salad is for fresh veggie (and herb!) lovers. 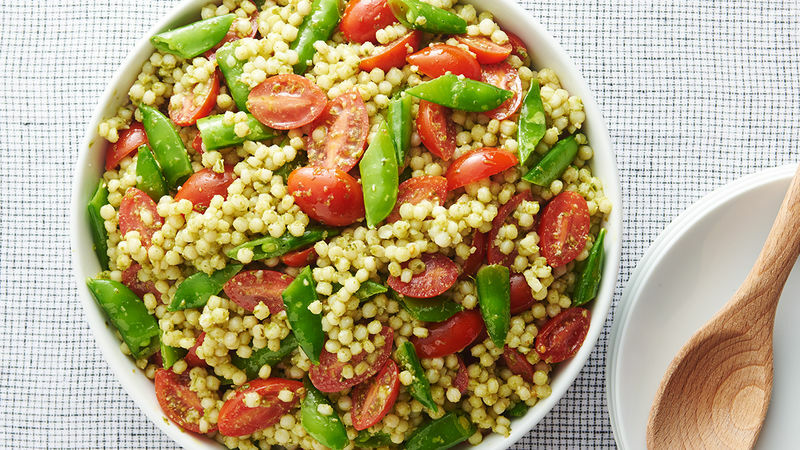 It combines basil pesto with fresh tomatoes, sugar snap peas and couscous in a salad that’s perfect served hot or cold. Best of all, it only takes about 15 minutes to make. This salad uses pearl couscous, also known as Israeli couscous, which has a larger grain and a fluffy texture. The size is better for young kids, since it doesn’t roll away so easily. But it’s pretty tasty for adults too. And the salad? It’s awesome with a glass of pinot noir. Check out the rest of our delicious couscous recipes.